You can download up to ten Yoga Anytime videos at a time for offline viewing! This is a great feature for those who are traveling without an internet connection, or for those who have better access to data and higher internet speeds during specific times of the day. Currently, this feature is available to members with iOS devices (iPhones and iPads) and we hope to expand access to this feature in the future. To get started, download the Yoga Anytime app from the App store. Then, open the app and click the Account tab at the bottom right corner of the screen. Click the blue Log In button to log into your Yoga Anytime account. If you are not a Yoga Anytime member, you can sign up for an account here. Browse the app using the blue Filters tab to find the video you would like to download. Click the Cloud Icon (blue square with a cloud inside of it) underneath the video to download the video. You can view all of your downloaded videos anytime by clicking on the Downloads tab at the bottom of the screen. While you can only download a maximum of ten videos at a time, you are able to delete the videos out of your downloads in order to swap them for other videos. To delete a video, swipe left on the video (see picture). 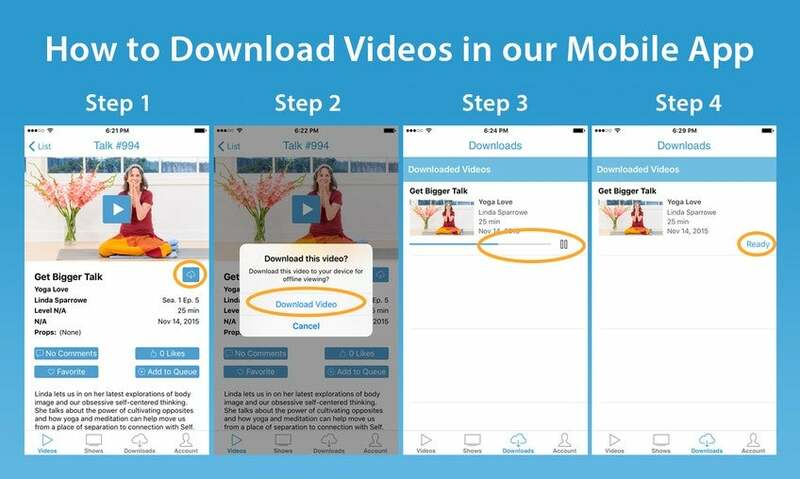 All of the downloaded videos will stay on your device as long as you are logged into the app and are a member of Yoga Anytime. 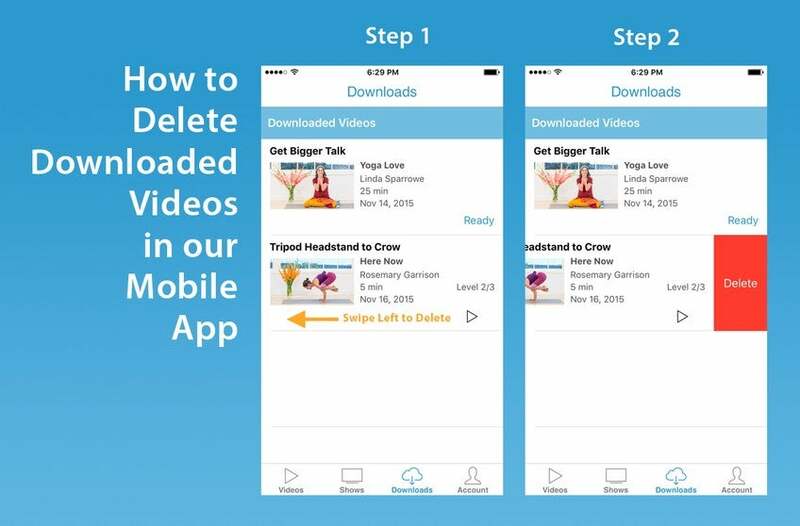 If you log out of the app our cancel your membership with Yoga Anytime, your videos will be removed from your downloads. A 60-minute video downloaded to an iOS devices is about 360 MB in size, or about 6 MB per minute. For those with restricted data plans, we recommend going to an internet cafe or other location that offers WiFi. This will allow you to download our videos without counting against your data plan. Please contact us here if you have any questions or feedback. We hope this feature makes it easier for you to enjoy our videos!